After an intense 2016 race season, with a German Stock + Modified title, a Reedy 1/12 Race win, our season ended with a double podium and TQ at the European Championship 1/12. The season went well and now we use the free time to update our page and plan new future projects. First change is our 1/12 tyre compounds. Please check to see the new updated range. Also there is couple of new things from Team Orion, that you can already find on our page. Speedtech RC: Hello Jilles, thanks for taking the time to have a chat with us. We heard you are in your home country, The Netherlands, right now. Are you only here for holiday? No problem! Yes, I’m in my home country for the summer holidays, unfortunate not only for holiday. This summer I have a busy schedule with three EFRA euros, ETS and some practice as well. 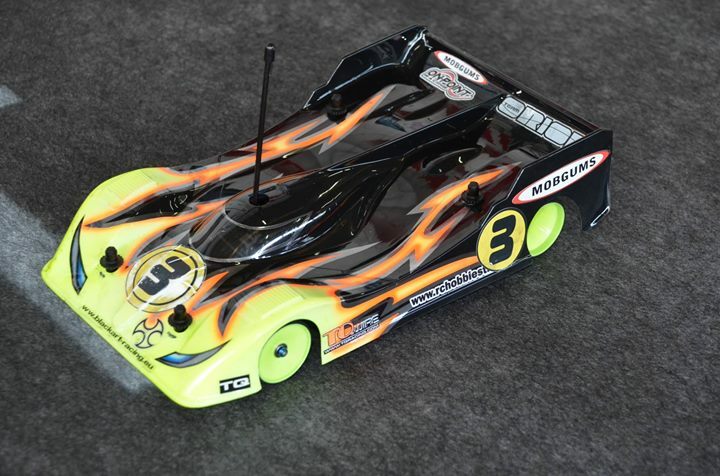 Speedtech RC: As a former 1/12 Vice-Worldchampion, you again have choosen to use the On-Point 1/12 car and MobGums tyres for the upcoming World Championship in october. There was obviously also other team options, why did you decide on On-Point/MobGums? With the Worlds coming closer a few month ago I spoke with my good old buddy Markus to run his On-Point car. Obviously he runs the same electronics as I do, Orion! Markus is not the youngest driver in this sport anymore, but he still had some great success over the last years so my choice was pretty easy to make to run his competitive package , On Point, Orion and Mob Gums tires! Markus his experience in 1/12 is one of a kind so I feel very confident he will help us to get the best out of our package! Speedtech RC: What do you expect from the 1/12 World Championship and who are your favourites for this race? As every Worlds I think there are pretty much the same guys who will be favorite for the title. 3 times World Champion Naoto is ofcourse the guy to beat but other fellow racers such as Volker, Rheinard, Moore, Harper, Hagberg and Mobers are drivers who are be able to fight for the title as well! Speedtech RC: We met you for the first time in Apeldoorn 1996. There you won the B-final at the Pro 10 European Championship with a standard Corally F1 car. Back than it was already pretty clear to everybody you will be a man for the future. In 2012 you won the TC World Championship, an intense feeling for sure, as this was close to your hometown as well. Do you still have goals in RC? Ofcourse winning the Worlds in 2012 was my highlite of my rc racing career that started pretty much in Apeldoorn. After winning the Worlds my goal is to win more big titles and hopefully I can win a Nitro Worlds some time! Speedtech RC: Jilles, last question, what do you think of the 1/12 class in general and its current situation? In my opinion 1/12 is still the most difficult class and therefor one of the coolest if you can handle the speed and cornerspeed these cars have! For people who are racing only the summer season, 1/12 is great in wintertime to keep your skills alive! I’m usually only racing big 1/12 events but I quess in general the class needs a little more drivers to make it popular again. I wish we had a nice carpet track in Thailand because sure I will run 1/12 for fun! Speedtech: Thanks for taking the time to answer. Enjoy your time in Holland with your family. Thanks and see you soon in Florida! The 1/12 season is about to open and with the 1/12 World Championships being close, we took the time to talk to Markus Mobers. We asked him some questions about racing and general things. 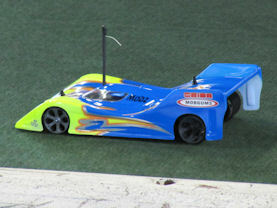 Speedtech RC: Hello Markus, with the 1/12 World Championships getting closer, are you already practicing for this race? Markus: Oh yes, I have been busy practicing, testing and building things since april, so basically there was no real summer break this time. Especially having Jilles Groskamp on our On-Point-MobGums-Team Orion train again for the World Championships, means a big motivation for me. Jilles and me always have been a great team, so I want to make sure we both have a superb basis to start. Speedtech RC: What in particular did you test during summertime? Markus: Well, the first couple of weeks I used to finish our new 1/12 tyre-line, the 1/12 MobGums Dishers. Those tyres have been a major boost for the full MobGums team in the last couple of months and we used the first samples at the Snowbirds and the Euros 1/12 with huge succes. I still needed to test some rubber samples and the full range is fixed now. Than I tested some things with different chassis layouts, comparing transverse and inline battery position and some rear roll centre tests. Further there is some new nice 1/12 products from Team Orion coming, I tested those, but of course I can’t exactly say what. Right now I am about to finish Jilles his and my cars. It still seems to be early for that, but as a family guy I of course don’t want a big hassle close to the race. Speedtech RC: After your switch to On-Point and Team Orion products in 2011, it seems this has been a major boost for your racing!? Markus: Of course there is some reasons for that. In 2008 and 2011 my sons were born. It is a normal procedure in life, that this is more important than RC racing. So I of course supported my wife and spent as much time as possible with my boys. Free time gets way less, but once all has settled down, you learn how to use the time better. I am really enjoying the time with the family and I do have lots of fun with Mika and Louis. Surely the switch to On-Point and Team Orion was very positive. I immediately won the Snowbirds in 2012 with the car and Team Orion electronics. This does not mean I had a bad time at Team Serpent, but due to the situation and restructure at Serpent, they could never act in the way technically how I wanted. I don’t blame them, but suggested improvements could not be done due to the internal situtation. Nevertheless I am happy for Serpent, that they do fine again now. Speedtech RC: Who are your favourites for the upcoming 1/12 World Championship? Markus: Surely Naoto Matsukura should be mentioned first. This boy is super talented and has a great mechanic with the well experienced Naoya Kitagawa. But….he is not unbeatable. I think Jilles has a superb package and really has a big chance to match Naoto and win. Further I do count Keven Hebert and Ronald Völker in. The young canadian is always hard to beat on US ground and I don’t need to comment on Ronald. He is a miracle always. But you never know, there is at least 20 people that can make the Top 5. Speedtech RC: How do you comment the current situation of the 1/12 class? Markus: In my opinion 1/12 itself is doing well. Especially in Japan, USA, GB and some other european countries it is doing fine. The situation in EFRA and IFMAR is more or less problematic. I think drivers are not really happy in the way the class is treated or rule decisions are done. Too many decisions are made without drivers, this does not really help the sport on the real race basis. Of course when I started RC 30 years ago there was no internet or mobile phones, communication was not as easy as nowadays, so I think the voting system needs to be changed dramatically. Votings in EFRA or IFMAR are not representative anymore, there is people voting for 1/12 that don’t know the class and their national 1/12 drivers are not even involved in themes. A good example is the current WC, first it was decided to hold the WC on asphalt, which was not wanted by the big majority of drivers, than there was made a questionable decision on additive/applying procedure. It could be so easy to prevent useless discussions like this, simply ask drivers or create a drivers community per class and let them vote per email. Technically the class needs a better starting base for beginners. But this maybe has to be done on a national level. Right now it is almost impossible for 1/12 beginners to control a 1/12 with a 10.5 motor. It is simply too fast. This is done very well in Japan and USA. They have a 1/12 class based on 17.5 motors, which is a great basis for beginners or old dudes! In the USA this class is huge, but it seems european people have a problem going a bit slower somehow. Speedtech RC: Last question Markus, what are your goals for the upcoming 1/12 season? Markus: My biggest goal is of course to increase the popularity of MobGums, On-Point Racing and Team Orion 1/12 products. It is great fun to see all brands growing a lot on the 1/12 market with my support over the last 2-3 years. This shows that hard work pays off. As far as racing is concerned, I really would love to see Jilles win the Worlds with cars I built. Personally for myself I think everything is possible too, I did practice hard and the Euros and Snowbirds showed big potential. To be honest, my most wanted goal is still winning that 1/12 European modified title. I have been close too many times. 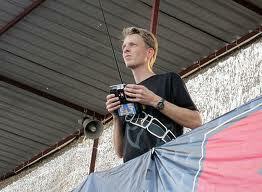 Speedtech RC: Thanks for your time Markus, we wish you all the best and do hope you can reach your goals. The all new Team Orion Advantage Touch Duo 2x10 amps charger is updated in our Team Orion product range. A great charger, that offers 12V or 220V connection and charging two packs at the same time with 10A! On-Point - Team Orion - MobGums European Champions again! We are very sorry for no upgrades lately, that last couple of months were very busy and intense, but majorly succesful for our products and race team! Indeed this has been the most succesful season ever for our Speedtech team and products. In january history started, Markus Mobers took three podiums at the Snowbird Nationals and hardly chased the current 1/12 World Champion Naoto Matsukura. Besides two third places at the end in 1/12 scale also the On-Point World GT car rocked, and took the runner up spot behind Josh Cyrul. Next up was the 1/12 German Nats. 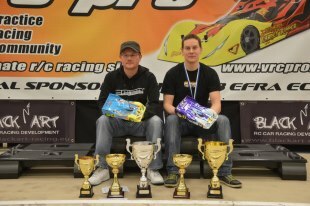 Markus took TQ and also won his 19th German 1/12 title with his Orion powered On-Point. Also Joey Sorber finished a great 4th. In Stock old friend and team driver Jens Ginnuttis took 3rd overall for On-Point, Orion and MobGums! The season's peak point was the European Championship 1/12 end of march in italy, Scandiano. Markus dominated stock, he took TQ and won the title for the second time in a row. Also Speedtech's Helge Johannessen took a great 7th overall. In Modified Markus and Arnaud Lemperiere were on a mission too. Arnaud quaified 7th at his first ever Euros and showed some great talent and skills! Some bad luck in the mains gave hime 10th overall. Markus qualified 3rd after struggling to find the right setup. After finding the right settings he won the last run of qualifying. In the first A-main Markus had a hard time getting by 2nd qualifier Ollie Jeffries and got tangled up in traffic giving him only 4th place. In the second main Markus passed Jeffries fast and tried to catch the leader Alex Hagberg. Both were running within 1 second for 8 minutes. In an last lap move Markus put himself besides Hagberg, but accidently Alex got taken out by Markus. In an sportman move Markus let Alex go. This meant Alex was already the Champion. Big congrats to him! In the third main Markus simply followed Jeffries and took it easy, as he knew 2nd in that main would give him 2nd overall. This way the main ended and Markus was also European Vicechampion 1/12 Modified. Another great result came from Speedtech's Tim Altmann, who finished 14th overall, his best ever 1/12 Euros result! - Team Orion wins again! The speedo/battery/charger and motor combo is simply outstanding! 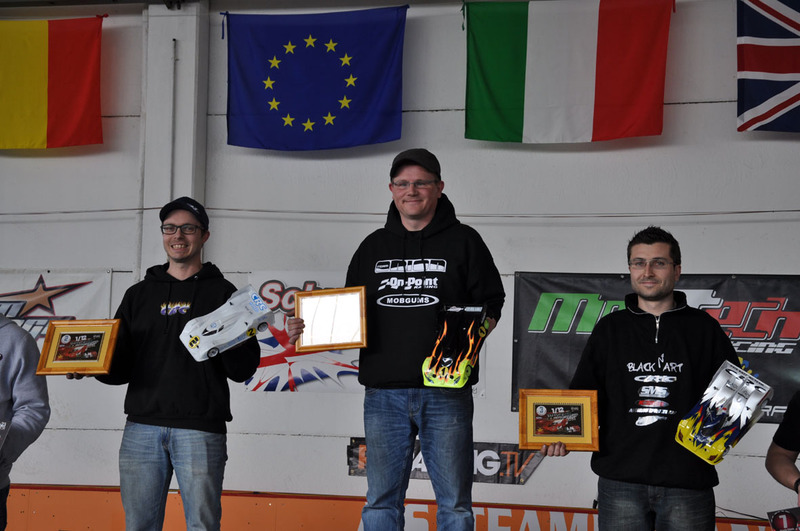 - Speedtech Foam Liquid rocks again and wins his 2nd European Championship title! On-Point OP12C now available as full kits in our shop!! On-Point 1/12 conversion sets in stock. The price is lowered to 159 euros now!! The full kit will be available in 3-4 weeks. The price for the full kit will be around 250-260 euros. Also back in stock: IRS shocks, Silva shocks, TQ wire, AE frontend parts, Team Orion VST 2 motors, Team Orion speedos, Team Orion batteries. Team On-Point, Team Orion and MobGums dominate the first Nuclea Mol race in Belgium. Markus Mobers TQ's Modified and wins in a blistering pace. 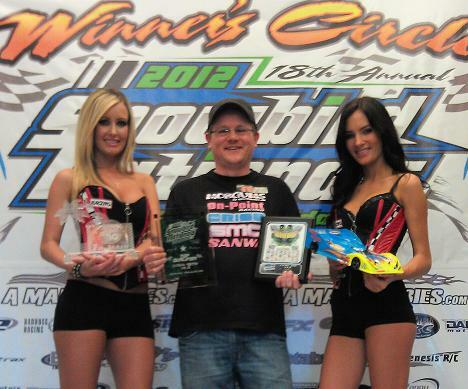 Speedtech RC's Daniel Merk dominates stock in great style!! TQ and win with a huge! gap. Watch out for a talented old dude crossing your way! The On-Point and Team Orion/MobGums team is extending!! Welcome European A-finalist Helge Johanessen from Norway and French top drivers Patrick Miltat and Arnaud Lemperie! 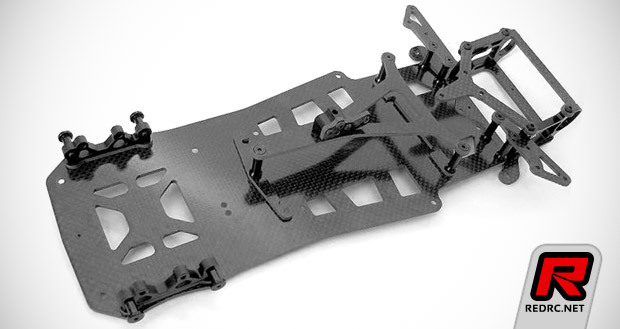 Blackart 005 and Protoform AMR12 / TR12 bodyshells already in stock! MobGums graphite pod balancer plates, graphite front ride height adjustments and Jaco/Parma trueing tool in stock! Bearings and diff parts in stock! 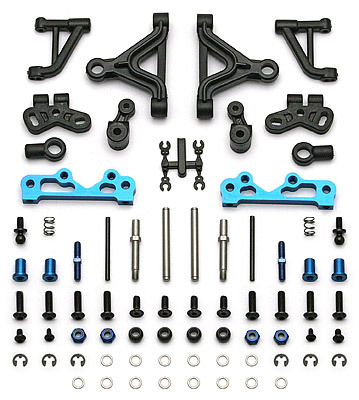 Associated frontend parts in stock! The full range of Team Orion 1/12 products is updated on our page. Please check under Team Orion products. Also other ranges are updated! We are very proud to distribute Team Orion 1/12 racing products from now on!! Over the last 4 years our relationship to Team Orion has grown rapidly and one of the world leading power plant manufacturers does trust in our test work and promotion on the 1/12 market a lot. Check our site frequently within the next couple of days for more news. Soon we will be able to offer 1/12 dealers and customers the most finest products in the world! Our new Touring additives are ready. Approved and tested by ETS Champions. Again we used the summer for intense testing and offering even more great products to our customers. As there was a major interest for Yokomo R12 offset rear tyres, we will have our Truerun 1/12 rear tyre line in Yokomo offset as well from now on!! Further, we will have three new additives soon. One will be for 1/12 carpet, as addition to our genius Speedtech Foam Liquid. This one will be less oily and gives a smoother feel. The other ones are for Touring Car. One for indoor and one for outdoor. You can find the pricing under "Usefull race-stuff"
MobGums tyres and Speedtech RC rule the 1/12 European Championships!! 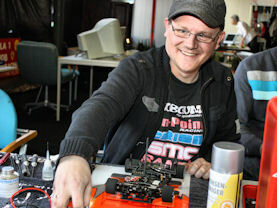 Speedtech RC owner and the man behind MobGums tyres, Markus Mobers, TQ's and wins the 1/12 European Stock Championships. He Tqed every qualifier and won all three A-mains in an impressive style. In Modified things looked good after 3-4 qualifiers too, with still a chance for TQ. The tricky track and traction conditions changed a lot, so at the end little things were missing. Still a 4th overall is a great result. We really like to thank Juho, Vesa and Alex for choosing our tyres and for sure our customers. More than 50% of the field used the new MobGums Truerun tyres!!!! 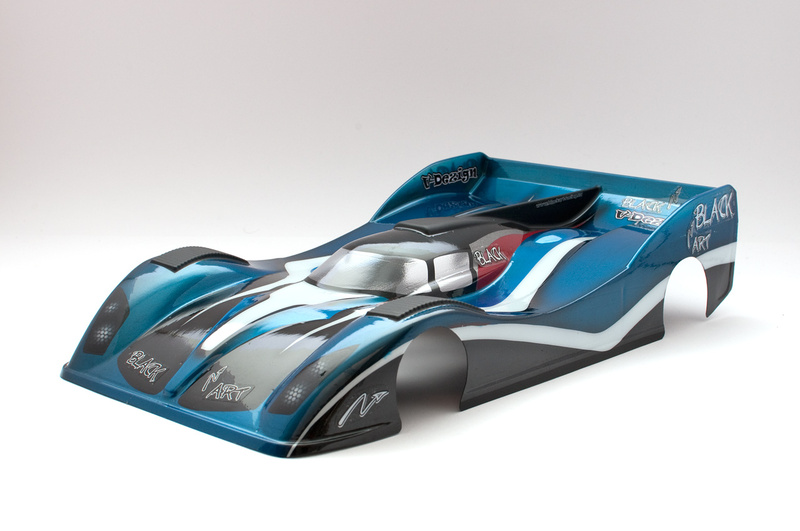 On-Point racing has upgraded their 1/12 kits for the 2012/13 season. The topdeck is smaller for more space and more front chassis flex, which makes the car even easier to drive!! Check our parts list for the new part-numbers. A picture of the new design will follow soon! We are proud to announce our new line of 1/12 tyres, the TRUERUN series. Those tyres are already available on december 15. Please check "Tires and rims" for more details. 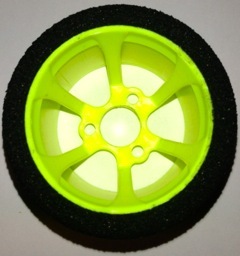 Soon we will announce our brand new 1/12 tyre range. After a lot of test work we are finally ready to progress! We like to thank JACO Racing for their long time support and are looking forward to a new challenge! Jilles Groskamp joins On-Point Racing to race the OP12C at the upcoming 1/12 worlds in Holland. Together with Mobers and On-Point owner Paul Cicarello this is for sure a competitive and fast team! On-Point WGT kit has arrived! Its there, the next genius On-Point product, the On-Point OP10C World GT conversion kit! This kit is based on the super succesful On-Point OP12 kit, that recently dominated the Snowbirds Nationals and German Nationals. Check our page for more info! SPEEDTECH, ON-POINT, MOBGUMS AND ORION DOMINATE BIG!!! Early 2012 was an intense race period with Masters of Foamracing, Snowbird Nationals and the German Nationals 1/12. All those major 1/12 races proved Speedtech RC and his main man Markus Mobers took the right decisions for the future, not only for racing, but also to provide the potential 1/12 racer with the best products there is!! All three races were dominated, Markus won the Masters of Foam, the Snowbird Nationals and German Nats in style. Speedtech RC especially likes to thank his business partners, teamdrivers and supporters for a great season. Watch out for a great package and some new thrilling products soon! NEW Blac kart 005 bodyshell now available!!! MobGums, On-Point and Orion destroy competition!! Markus Mobers wins EPS 1 race in Modified. The full Modified podium is powered by Orion and uses MobGums tyres! The top 2 in Modified use the On-Point 300 kit. Xrays John Ermen wins the Stock class with MobGums tyres. Tq was Robert Krens on MobGums tyres and Orion batteries. Mobers sets new blistering track record of 9.66, which is more than 1,5 tenth faster than the previous record. Once again the whole Modified podium is using MobGums tyres and Orion batteries. 4 A-main finalists use the On-Point 300 Kit! The most used car here. Also in Stock the full podium uses MobGums tyres and Orion batteries. David Arbandt takes 3rd for On-Point in his first outing with the car! Tq went to Jens Ginuttis, also on On-Point. A truly dominating november, stay tuned for more!! The On-Point spare part list is complete now, the first batch of spares is coming in begin november!! The first 30 OP 300 kits are sold. Most people have already ran the car and are really amazed about the quality and speed the car shows. The first real race test will be soon. Mid november there is the first EPS race at MACH Hemsteede, directly followed by the first german 1/12 qualifier at the Sipotech track. Watch out for a strong On-Point-MobGums performance!! Orion 1S packs in stock now! New Associated batch arriving begin november! Markus has tested a new Blackart 005 prototype shell, which showed great performance! Sure a great contender to the PF AMR shell. It will be available from us end november! New stuff in stock now! 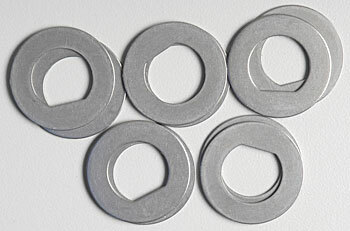 We just received Associated frontend parts, side springs, front springs and center springs. Further we received some other genius stuff from the US. Check our pricelists for more details! Speedtech RC doesn't sleep, we are ready for the indoor season! -M. Mobers will join forces with On-Point Racing USA. ©2019 SpeedtechRC. All Rights Reserved.